If you're looking for a fun way to experience the beautiful winter scenery in Mammoth Lakes, head out on snowshoes. They’re easy to use and require a minimal amount of equipment to get started. Snowshoe rentals for all ages. The staff can also help with trail selection. Snowshoeing is a great way for people of all ages and fitness levels to experience the beautiful winter scenery in the Sierras. Tamarack Cross-Country Ski Center is a great place for beginners to get lessons and practice on nineteen miles of groomed trails. For an experience a bit more off the bitten path, head out to one of the many trails located in the Inyo National Forest. To arrange your own once in a lifetime snowshoeing trip, contact one of the experienced guide’s located on this page. Snowshoeing is a great way for people of all ages and fitness levels to experience the spectacular winter scenery of the Eastern Sierras. The activity is easy to learn, and requires a minimal amount of equipment making it a great choice for families with kids. Tamarack boasts nineteen miles of groomed trails that are available for both cross-country skiing and snowshoeing. If you’ve never participated in the activity before, this is a place to learn. Lessons and equipment rentals are available here. Tickets cost $26 for adults, $20 for youth's ages 13-18, $14 for children ages 7-12, and $20 for seniors ages 65-79. Rock Creek has 9 miles of groomed trails available for cross-country skiing and snowshoeing. 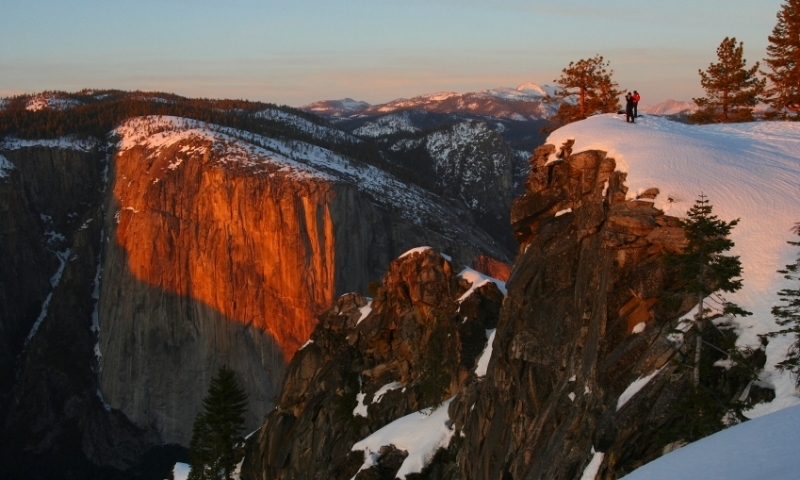 The facility is also a great jumping off point for adventures in the John Muir Wilderness. Equipment rentals are available. If you enjoy hiking here in the summer, you can access all of the same trails during the wintertime. The 6.5 mile Inyo Craters Ski Trail is one of the more popular trails in the area. It begins at the Inyo Craters parking lot. 5.6 mile Mammoth Meadows Ski trail is another great option.